I am nervous about meeting Allison Au and have been so for a whole week (and more) before the 20th of June, when we had agreed to meet. Interviews always make me nervous. The very word has always filled me with dread, and I am always reminded the Denial of St. Peter, Caravaggio’s iconic painting depicting the Simon Peter being confronted of a handmaid outside the praetorium where Jesus Christ was being questioned after his arrest. There is also the fact that I have crammed other appointments into that morning and find it never helps when I have to rush from one appointment to another; for that I have only myself to blame. And the map directing me to The Bandit Coffee Shop, way out East into Gerrard Street was not very helpful at all. I thank God it isn’t the Ides of March…although it could have well been: the traffic was horrendous and I may as well have added another hour and a half to my estimated travel time from the flat that I share with a cat and a family of guinea pigs. However, it was a much cooler day to begin with and I was listening to Allison Au’s music on the drive in. I am captivated by Miss Au’s voice. It always seems close to me; not quite in my ear, but always close at hand. 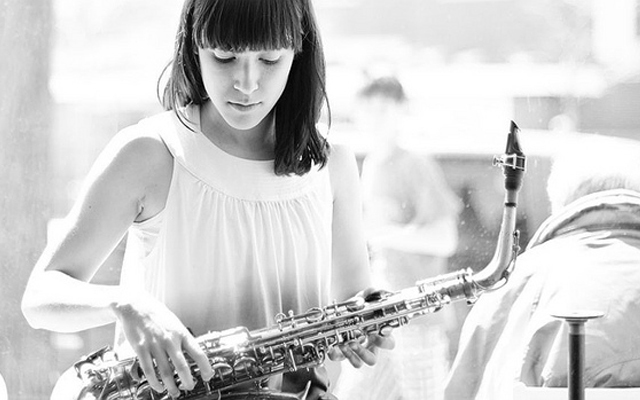 Curiously and utterly contrarily as well, I not only hear the notes that glide and soar, gambol and tumble out of the mouth of her alto saxophone: I feel and even taste as if I’ve ingested their music no sooner than they (it has been) are expelled with every hot breath that can no longer hold onto them. I once was afraid of hearing music in this way, but now I no longer am. Moreover as I am older I realise that I have probably always been anthropophagous about music, almost secretly ingesting and digesting everything from semibreves to demi-semi-quavers and more. It’s what has drawn me to study, perform and now write about music from the time I learned to read and pronounce my alphabets and my vowels. 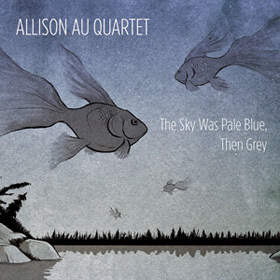 Today the music of The Sky Was Pale Blue, Then Grey by the Allison Au Quartet is echoing and bouncing around in the confines of my small motorcar. It makes this excruciating hour-long stop-and-start section along Lake Ontario almost enjoyable. Breathing in the air exhaled by Allison Au’s saxophone, relishing the nuanced exchanges between Miss Au, her pianist, Todd Pentney, following the bass line melodies that Jon Maharaj carved out for himself from the saxophonist’s compositions and work out the intricate tap-tap-sizzle-and-bop of Fabio Ragnelli’s drums – all of which seemed impossibly and especially beautiful on “What Went With The Wind” – did much more to take the tedium out of driving than chewing on a stick of Wrigley’s; it helped ensure that I was both concentrating on every change of gear as well as forget that I was driving at all. I had already called Allison Au once, when I was afraid that I had got everything – the map and the directions – all wrong. Then suddenly it showed up on the horizon: a sign in blue saying: “Gerrard Street”. I parked the car and walked back to The Bandit, looking at the door numbers until I came to the one I wanted – 1925 Gerrard Street. I saw her then. She was sitting at the bar along the window, facing the street with a pair of enormous headphones wrapped around her head, lost – as usual – in the music. “Djavan,” she told me much later when I asked what she was listening to. I was less surprised than I thought I would be because somehow I always thought of Allison Au as a writer of beautiful songs before she was anything else: pianist, saxophonists or bandleader. So… was that a melody blooming in her head, sheltered between the headphones that covered her ears before she would set it free? It is now more than 200 years since the Belgian dreamer, inventor and musician (for sure) Adolphe Sax invented and patented the first saxophone. It was unbelievable as that Sax’s then-lugubrious instrument designed specifically for use in classical orchestral music (there was another design and prototype that Sax created with an eye towards its potential adoption by military bands) would be embraced by Hector Berlioz, Gioachino Rossini and Giacomo Meyerbeer, who were bowled over by the saxophone’s novel timbre. Wagner’s reaction was likely more typical when he, in a fit of pique infamously declared that the saxophone sounded like a preposterously made-up word Reckankreuzungsklankwerkzeuge. There were also attempts by manufacturers of orthodox instruments and their agents to ‘bankrupt’ Adolphe Sax for what he’d done. And then there were those who threatened to kill him. Sax, of course, would have the last laugh from beyond the grave.